The Sense Herakles Plus Tank Replacement coils are engineered to add versatility and durability to the Sense Herakles Plus Tank Sub-Ohm TC Tank. These advanced atomizers are constructed with enormous airflow capability and superior Kanthal A1 or 316L Stainless Steel heating wire allowing high vapor capability. It is prebuilt with 100% Japanese Organic Cotton to prevent dry hits and provide robust flavoring. 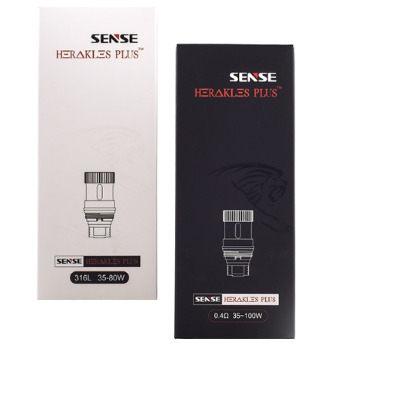 The Herakles Plus Replacement Coils by Sense combines the ease of ready-made coils with enlarged wicking ports for maximal vapor capability. Resistance: 0.2 ohm 316L and 0.4 ohm Kanthal A1. Prebuilt with Japanese Organic Cotton. Works with the Herakles Plus Tank only! New coil/wick units must be tested and then used first on a strong basic electrical APV such as a Silver Bullet that will not be destroyed by a short circuit.